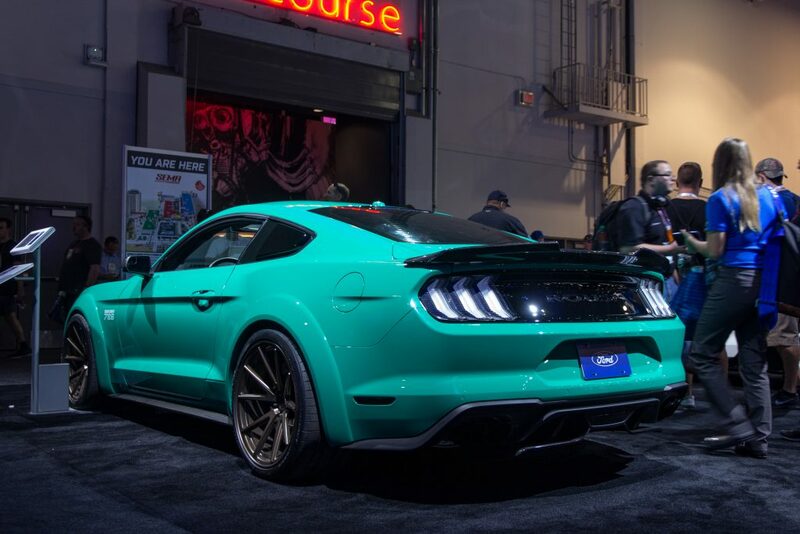 While on the official Ford booth at the SEMA Show 2016 in Las Vegas the Ford Focus RS in many versions had the upper hand, in 2017 it was the “Stang’s” again and the usual suspects in the form of trucks. 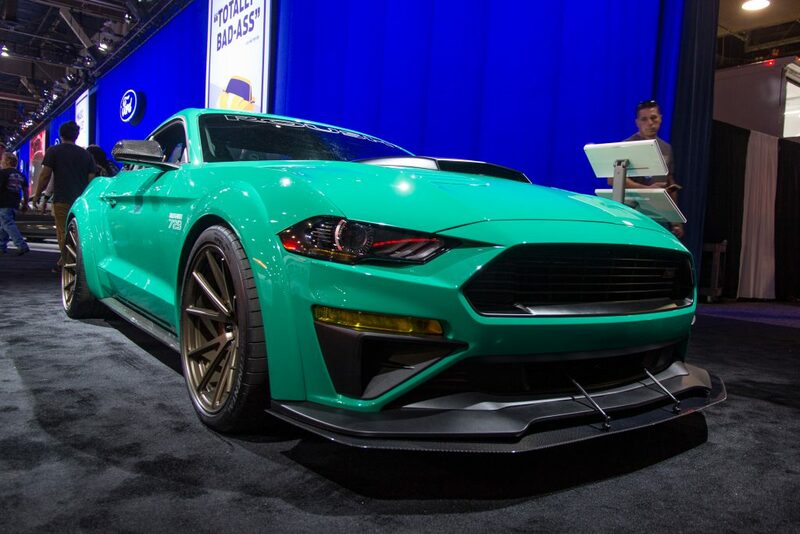 A definite “Über-Mustang” was the Roush Mustang with its brute supercharger conversion, 2018 bodywork and Roush / Stratasys wide body kit. 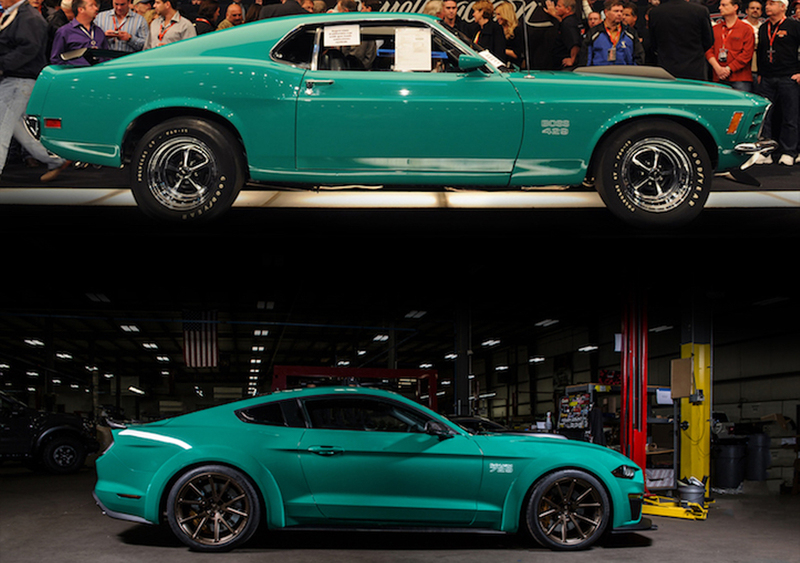 Not only because of the painting in a Sherwin-Williams Custom “Grabber Green”, the Roush 729 Concept pays homage to the Boss 429 special model. Just like back then, the “Boss 429” in the seventies had plenty of power, also in the modern Roush 729, the performance does not come too short. The elaborate converted Roush 729 Concept in conjunction with a Ford Performance / Roush compressor conversion, four-pipe exhaust system and Air-Intake achieves up to 729 hp! The Amercian “Über-Motor” is a 5,0 liter Ti-VCT V8. As you can see in the “Making-of-Video”, there was a lot going on while building up the Roush 729 Concept. 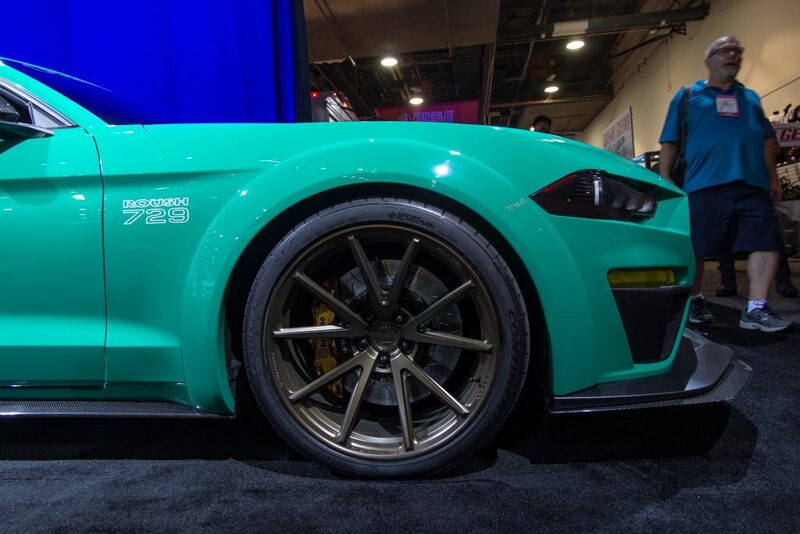 Unfortunately, the Mustang was closed off on the SEMA show and therefore we cannot show you a picture of the Watson roll bar, the Recaro seats and the Sparco belts. But Roush Performance emailed us the link to their “Making of” YouTube video. At the front, the 2018 Mustang is adorned with a new grill and splitter from Roush. Also the air vent inserts in the hood are from the Ford tuner. The various carbon fiber components at the Ford were contributed by Anderson Composites. 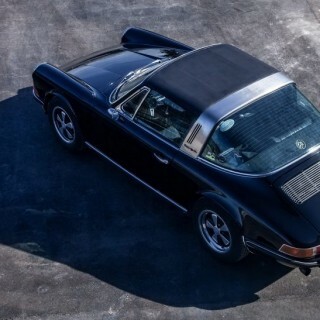 The carbon fiber on the side panels and the exterior mirrors are from Anderson Composites. In order for the 729 hp Mustang to bring its enormous power to the road, a coilover kit in “Roush Performance”-setup is used that is independently adjustable in rebound and compression damping. 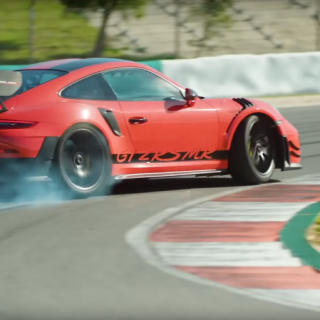 In conjunction with the 305/30 tires on the rear axle, the traction is sufficient. The Roush suspension is based on our KW coilovers Variant 3 engineering and ensures driving dynamics and driving comfort on the road. Since the Roush 729 Mustang is more at home on the road than at Show&Shine, the Americans left it at the minimum lowering and put 295/30 and 305/30 Continental Extreme Contact on the 10 and 11 x 20 inch Roush Performance RVS rims (made by Vossen). 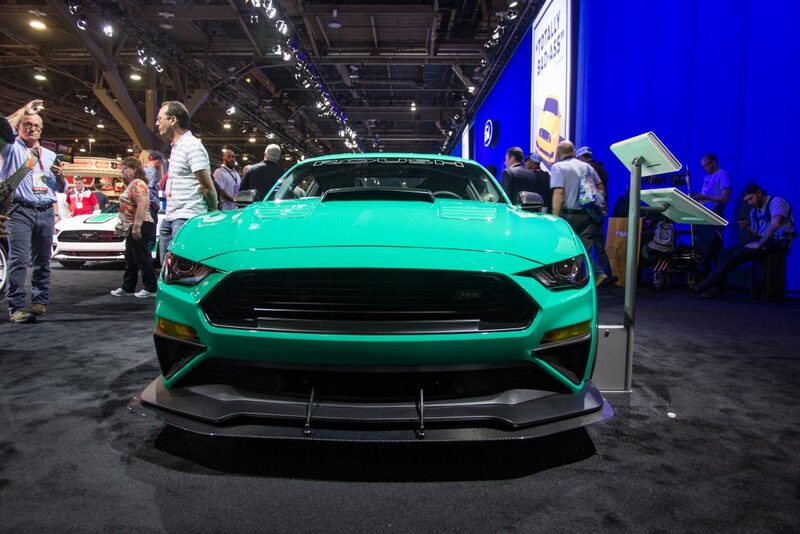 Soon, Roush Performance and Ford USA are launching a lot of performance accessories for the Ford Mustang model year 2018. 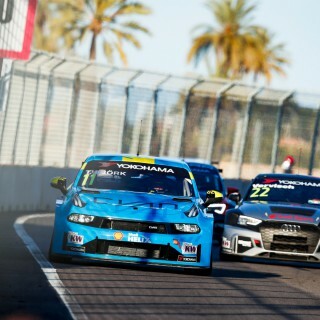 US car fans will also be able to get Roush hardware via various US car importers, which are partly also KW specialized dealers.